* France, Portugal & Italy: Only available for continental deliveries. * United Kingdom: Not available for Northern Ireland, Guernsey, Jersey and Isle of Man. We maintain a permanent stock of our main products. However, at certain times, a product may be in the process of manufacture. In these cases, we inform the customer promptly of planned delivery deadlines; stock replenishment is normally completed in 7-10 days. This is the period for preparing the packages and organising the shipment; it is less than 24h from the order confirmation (on business days from Monday to Friday). Normally, we process and ship the orders the same day they are received (except in the case of stock failure). 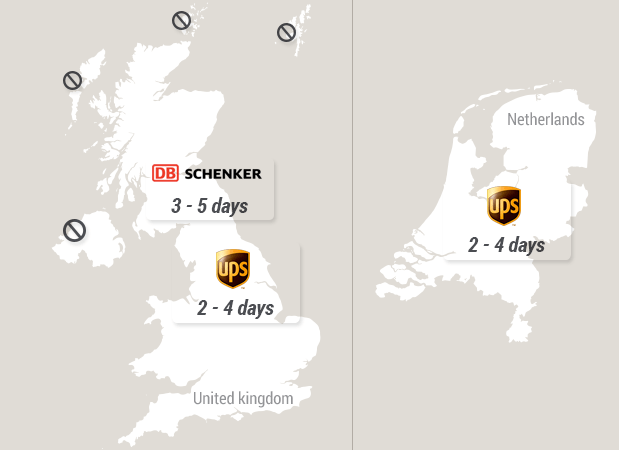 United Kingdom: 3 - 5 business days (with UPS: 2 - 4 days). Belgium: 2 - 4 business days. Netherlands: 2 - 4 business days. Luxembourg: 2 - 4 business days. * The delivery times are only provided for information purposes, without any obligation and will not be legally binding at any case. Shipping costs are NOT included in the price of the products; they are added to the shopping cart depending on the volume and destination. ATTENTION: By default, in 'anonymous' carts (from non-registered customers) the Mainland Spain shipping cost is indicated. If you want to know the shipping costs for other destinations, please register an account or use the shipping calculation tool available in the cart summary. For large orders, the maximum amount of shipping costs applied to customers will be 70 €. Skum Acoustics strives to maintain the lowest possible shipping costs. However, please not that our products are BULKY items and the transport agents apply surcharges based on the 'volumetric weight'. Example: Vågor pack (10 units.) - Package of 0.22m3 / 6Kg. >> Volumetric Weight = 60 Kg. to be billed. For shipping to other destinations, such as non-continental deliveries or not available countries, contact us! For destinations outside the European Customs Union, contact us. In any case, we will send you a special quotation with the detailed product prices, shipping cost and DUA charges (if is applied). * Our logistics partners allow us to ship to any part of the world. Contact us..